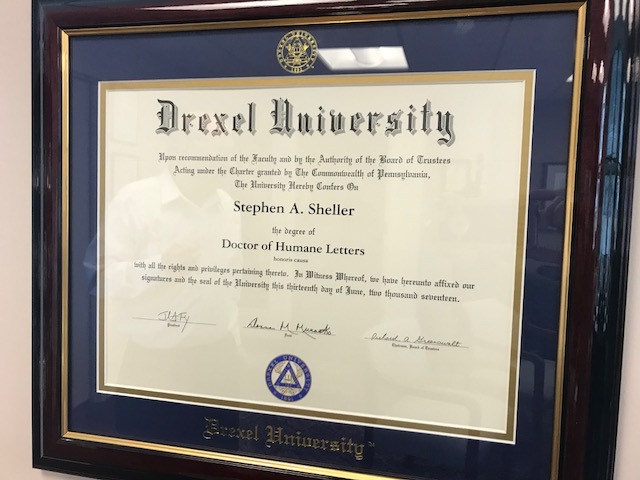 Stephen A. Sheller, who has served on the board of trustees of Drexel University since 2003 and on Drexel’s Thomas R. Kline School of Law advisory board, will receive an honorary degree at the Drexel University commencement ceremony on June 13, 2017 at Citizen’s Bank Ballpark in Philadelphia. For his commitment to championing the disenfranchised, Drexel will present him with the degree of Doctor of Humane Letters, honoris causa. His long and storied career can be summed up in a few words: a champion of the disenfranchised, those harmed by the negligence or intentional acts of corporations or others, in need of a strong legal voice. His early legal battles saw him take on government and corporate entities in 1970‘s Philadelphia— from defending the Black Panthers to protecting the rights of African American female workers in one of the first successful equal pay for equal work cases in the country. He also championed the rights of Penn State students to vote in the towns where they attend school, setting precedent for student voting rights across the country. He has been described in the media as a modern day “Forrest Gump”— seemingly always in the right place at the right time for a cause: the first legal boots on the ground in what would turn into the Bush v. Gore litigation controversy of the 2000 presidential election; the first to blunt the tobacco industry with multi-billion dollar verdicts and settlements due to his unique legal theories focusing on fraud, not personal injury; responsible for Ringwood Mines/Landfill, the Ford Motor Company’s industrial dump site becoming the first site to be added back to the National Priorities List; and his use of the little-known/utilized False Claims Act (or ‘Lincoln Law,’ stemming back to the civil war) to bring pharmaceutical companies to heel— with settlements and fines in the billions. To this day, nearly half of the top ten Pharma False Claims settlements have his name on them. 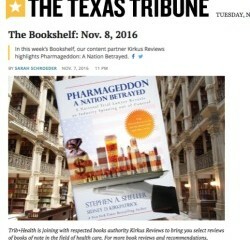 Mr. Sheller has written two books about his career and life experience: a memoir, “Lawyering in Times of Saints and Evil Doers” and “Pharmageddon: A Nation Betrayed.” The latter focuses on his dogged pursuit of the illegal marketing of pharmaceutical drugs, primarily the antipsychotic, Risperdal. In March of this year, he was interviewed by Mike Papantonio on the RT Network television program “America’s Lawyer” about this book. “America’s Most Admired Lawbreaker,” Huffington Post Highline’s first online DocuSerial, published in 2015 by Steven Brill, also highlights Sheller’s Risperdal cases. The true story of Mr. Sheller taking on the pharmaceutical giant Johnson & Johnson for the illegal promotion of the drug Risperdal to children has now been optioned by a production company. Representing children harmed by off-label antipsychotic drugs, Mr. Sheller strongly believes that the FDA should not have approved the antipsychotic drug Risperdal for pediatric use. He personally filed a Citizen’s Petition in 2012 requesting the FDA either revoke approval for the drug’s use in children, or at least add a black-box warning of the serious side effects. Undeterred by the FDA’s dismissal of his request without explanation, and lower courts’ ruling that his firm did not have standing to challenge the FDA’s decision, Steve filed a writ of certiorari in the U.S. Supreme Court, asking the court to decide “who has the constitutional right to challenge a government action?” A frequent commentator in print and broadcast media with extensive television appearance and video portfolio, details about this and other cases can be accessed on YouTube.com/ShellerPC. In addition to his service on the Advisory Board of the Salvation Army of Greater Philadelphia and his past service on the Board of Trustees of Pennsylvania State University, Mr. Sheller has served on the Board of Trustees of Drexel University since 2003 and also serves on Drexel’s Thomas R. Kline School of Law Advisory Board. 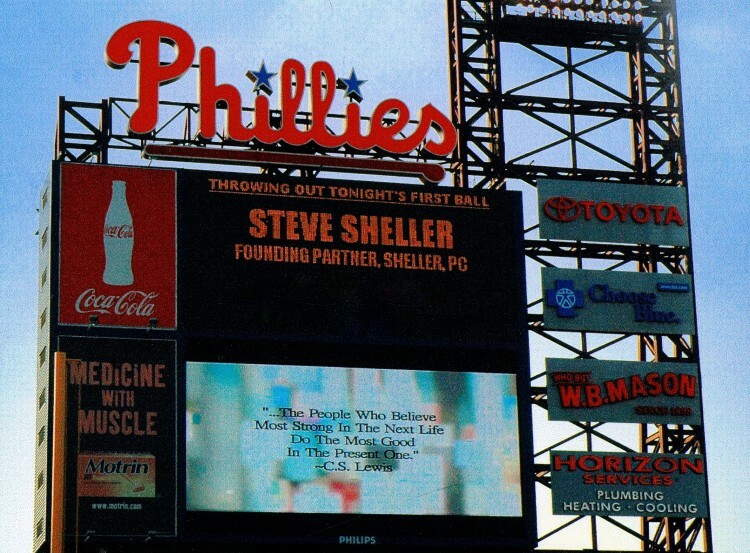 The distinguished list of accolades and awards Mr. Sheller has received include: the 2016 Clarence Darrow Award, Mass Torts Made Perfect Award bestowed by Robert F. Kennedy Jr.; the 2015 Lifetime Achievement Award from The Legal Intelligencer; the 2015 Best Lawyer in America; the 2015 Humanitarian of the Year, Citizens’ Commission for Human Rights Award presented by actress Anne Archer; the 2011 Tobacco Litigation Pioneers Award for discovering the tobacco industry documents and developing the legal theories underlying “Light”/”Low Tar” cigarette class actions; the 2003 Trial Lawyer of the Year- Trial Lawyers for Public Justice; and achieving Pennsylvania SuperLawyer, SuperLawyer Top 100 Philadelphia, and Top 100 Pennsylvania for five or more years. In 2010 Mr. Sheller received from General Raymond T. Odierno, the then Commanding General United States Forces-Iraq, a U.S. flag flown over the U.S. Embassy, in Baghdad, Iraq on April 15 of that year in recognition of support of the troops of Operation Iraqi Freedom. The Stephen and Sandra Sheller 11th Street Family Health Services Center of Drexel University which in 2016 was recognized as a model for the country for health care delivery to underserved populations by the National Academy of Medicine’s Vital Directions for Health & Health Care Initiatives. The Stephen and Sandra Sheller Commons of the South Philadelphia Free Library. This coming fall, The Shellers will be honored with The National Liberty Museum’s Heroes of Liberty Award for their work to help establish a permanent exhibit honoring the Pennsylvania National Guard and for funding their Young Heroes Program at the Tanner Duckrey School.